or the beautiful Victorian-style post arm to finish the customized look of your mailbox post. Whatever your mailbox needs, we have no doubt that OriginalMailboxFactory.com has a perfectly beautiful solution! Our mailbox posts are constructed with high quality materials to produce a high quality post, suitable for mounting any mailbox we make as well as many of those mailboxes made by our competitors. Each of our post styles is available in any of the following colors (as pictured below): New Age Bronze, Copper Vein, white, Sandstone, and black. You may also choose between a ball cap or a crown cap for any non-top mount posts. 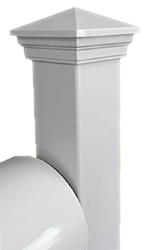 Our standard mailbox post is an attractive, economical, and secure way to mount your mailbox on a top mount style post. It's the perfect post for the Double Door Newport Mailbox! The post is constructed of a premium heat-treated aluminum 4x4 post with a fully welded top mount plate. The post is finished with a durable powder coated finish and includes stainless steel installation hardware. This functional post will easily support hundreds of pounds. Order your standard mailbox post now! The Brentwood mailbox post is a stylish solution to your mailbox mounting needs. The Brentwood Post is a 4x4 post constructed of high strength aluminum with a reslient powder coated finish, and is guaranteed not to rust. The post package includes a ball cap or crown cap, stainless steel installation hardware, and mount. 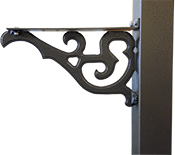 Choose between the classic contemporary-style bracket, or the beautiful Victorian-style bracket to finish your Brentwood Post. Order your Brentwood post now! The Newport Post is a high strength post designed to withstand harsh conditions. The Newport Post is a 4x4 post constructed of high strength aluminum with a resilient powder coated finish, and is guaranteed not to rust. 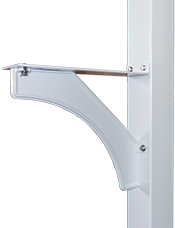 The post package includes a ball cap or crown cap, stainless steel installation hardware, and a high strength mounting arm. Order your Newport post now!